The Old Gin House hotel is a quaint historical waterfront hotel, located just a few steps away from our dive center. The hotel has a beautiful restored historical bar, ocean terrace, lobby and pool. The pool with towel service is located in the garden next to the garden view rooms. The rooms and suites at the Old Gin House are split up in four categories. There are fourteen garden view rooms, two ocean front rooms, two appartments and two one bedroom royal suites. 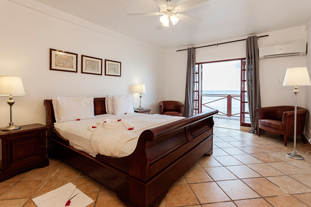 All rooms are furnished with large king size mahogany beds, colonial style furniture and equipped with free WiFi, air conditioning and cable TV. The ocean front rooms and suites also have a small fridge. Full American Breakfast is included at the seaside restaurant with a killer view. The chef prepare fresh fish, caribbean lobsters and of course the famous chicken and ribs. Cocktails and a fully stocked bar and wine cellar are available.